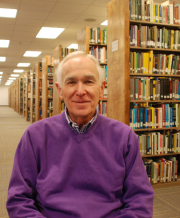 Throughout his long career, historian John Ferling has specialized in the American Revolution. He taught numerous courses on the Revolution, America’s Founders, and U. S. military history. He is the author of thirteen books, the latest of which is Whirlwind: The American Revolution and the War That Won It (2015). His other books include biographies of Washington and John Adams, and a history of the Revolutionary War, Almost a Miracle: The American Victory in the War of Independence (2007). Here is a portion of the brief autobiographical statement that appears on his website. My parents were from the same small town in West Virginia. My mom graduated from West Liberty State College and taught elementary school for several years. My dad briefly attended the same college, but dropped out during the Great Depression. He eventually found work with Union Carbide and continued to work for the company for 40 years. I was their only child and when I was one year old my father was transferred to Texas City, Texas, and that is where I grew up. I graduated from Sam Houston State University with a BA degree in history in 1961. Later, I received an MA from Baylor University and a Ph.D. from West Virginia University. Early on I taught in Texas, Kentucky, and Pennsylvania, but I spent most of my career at the University of West Georgia in suburban Atlanta. I retired from teaching after a forty-year career. I was always interested in writing. As a kid, I devoured the sports section of the Houston Post, as much interested in the writing as in the scores. In college, I discovered good books written by good historians and decided that I wanted to become a historian and to write history. I still love sports, however, especially baseball, and I have been a lifelong fan of the Pittsburgh Pirates. My wife, Carol, and I live in metropolitan Atlanta. Morris: Before discussing your latest book, Whirlwind, and other works, here are a few general questions. First, who has had the greatest influence on your personal growth? How so? Ferling: My parents. My mom was a teacher who understood the value of education, while my dad taught me the value of hard work, diligence, and listening to my teachers. Ferling: I came out of graduate school well prepared for a career as a professional historian. West Virginia University had a small graduate program in the 1960s, but it was excellent for my needs. The faculty took its teaching responsibilities seriously and made time for the students, but they were historians as well and all were actively engaged in research. Three professors had a profound impact on me. Kurt Rosenbaum, who was a German and European diplomatic historian, provided crucial guidance in my development as a critical thinker. William Barnes, an American historian and economic determinist, helped to shape my outlook. My mentor, Elizabeth Cometti, who specialized in early America, was important in my development as a researcher and writer. Ferling: I started college with an interest in history, but found my courses to be so boring that I decided not to pursue it. Fortunately, in the last required course that I had to take, a Western Civilization class during my sophomore year, I took Dr. William Painter. He didn’t lecture. Instead, he had us read assigned books, which we discussed in class. I found it to be an electrifying experience, one that for me opened an entirely new way of thinking about and studying history. By the end of that semester I knew that I wanted to teach history in college and to write history. Ferling: College was pivotal for me. It broadened my horizons, taught me to think and question, and introduced me to many things — such as art and classical music — that had not previously been part of my life. I went to college thinking that I might teach history in high school or that I might seek a career in the retail industry, probably working for a department store, something I had done during the holidays while in high school. I came out of college with plans to do something that had never crossed my mind four years earlier. Ferling: My dad graduated from high school just as the Stock Market crashed in 1929. His advice to me was to never risk investing my money in anything aside from U.S. savings bonds. When I went to work following graduate school I was thirty-one years old and penniless, so I couldn’t immediately invest anything. In time, things stabilized, but as I knew little about business or the stock market, I invested mostly in mutual funds and certificates of deposit. Sometimes, I wish I had taken the time to learn more about investing. Morris: Of all the films that you have seen, which – in your opinion – best dramatizes an especially event, development, or period in history? Please explain. Ferling: Two movies – The Thin Red Line and Paths of Glory. Neither romanticizes war and the latter, while dealing with an army, demonstrates the terrible ruthlessness to which those in power will resort in order to maintain their control of power. Morris: From which other history book have you learned the most valuable lessons about studying history? Please explain. Ferling: As a professional historian, I have read so many works of history over the past fifty years that it is difficult to pick a handful. But here goes. Alan Bullock’s Hitler, which I read while an undergraduate, demonstrated the means by which evil can come to power and how it is possible to carry out the most grotesque malevolence on a mass scale. Bernard Bailyn’s The Ideological Origins of the American Revolution provided a wonderful lesson in how ideas can shape behavior. Bruce Catton’s many books on the Civil War — which I read while a young student — James McPherson’s Battle Cry of Freedom, and David Hackett Fischer’s Paul Revere’s Ride and Washington’s Crossing were so gracefully and provocatively written that they influenced me as a writer. Ferling: I think leadership comes from the top down, but a great leader knows when the time is right to act, and leadership involves the ability to mobilize and galvanize the people, and to inspire the people to follow. Ferling: An effective strategy almost always involves both doing something and not doing something, and knowing when to choose the right alternative. To succeed, the strategy that is chosen ultimately depends on the acquisition of as much information as possible. Ferling: Almost always true, though I would add that what was once a dangerous idea can become dangerous yet again when, after becoming orthodoxy, it becomes harmful and needs to be replaced with another “dangerous” idea. Ferling: So true. If only Jefferson, who thought slavery abominable, had acted with greater courage to destroy the institution. Ferling: I spent an incredible amount of time during my teaching career serving on committees. I now regard the lion’s share of the time spent in committee work as having been wasted. One of the great lessons learned by those who achieve is how to manage time. Ferling: Ultimately, someone has to make the final decision, but the wise leader gathers information and seeks counsel – after deciding who among those surrounding him provides consistently wise advice – before making that final decision. Ferling: This might be correct for companies, but as a historian who has spent a career writing about military and political leaders, my sense is those individuals do not have the luxury of making mistakes. That said, no one profited more from his mistakes more than did than George Washington. As a young commander of Virginia’s army in the French and Indian War, he made one mistake after another, leading to open criticism of his leadership and character in the colony’s only newspaper. Washington took the criticism to heart and did not make the same errors during the War of Independence. Ferling: Washington, John Adams, Samuel Adams, Jefferson, FDR, and Martin Luther King were not great storytellers, but as I indicate in Whirlwind, they did alright as leaders. Morris: Let’s spend a bit of time discussing a few of your previously published works and begin with your biography of John Adams (1992). What did his wife Abigail see in him that most others people didn’t? Ferling: She discovered that he was incredibly self-centered and, through his treatment of a deeply troubled son, that he was not an especially compassionate individual. Morris: In your opinion, what would Benjamin Franklin say about Adams the man and the patriot? Ferling: Franklin did say once that Adams had a proclivity for acting irrationally, though he never doubted Adams’s patriotism or honesty. Morris: In your opinion, why was the election of 1800 a “pivotal” development in U.S. history? Ferling: It was pivotal because it saved the American Revolution from those who sought to block the fulfillment of what many – including Jefferson and Thomas Paine — had sought from the Revolution: “the birthday of a new world,” as Paine wrote in Common Sense, which included the democratization of the United States. Morris: Please explain the meaning and significance of the title of your book, Setting the World Ablaze (2002). Morris: In my review of it for various Amazon websites fifteen years ago, I note that you brilliantly analyze three towering figures — Washington, Adams, and Jefferson — within a specific historical context, to be sure, but also in terms of each other. You create and then explore a matrix of juxtapositions between and among them, comparing and contrasting all three in relation to each other but also in relation to the historical context on which each had such a profound impact. It seems to me that you are describing a crucible of juxtapositions during which the new nation is being created. Is that a fair assessment? Ferling: Each man brought his talents, ideas, and character to the American Revolution and its war, and to the nation that was given birth through the Revolution. Washington’s great talents consisted of keeping the beleaguered army together, inspiring confidence among congressmen, state leaders, and the general public, and from about 1779 onward leading others to understand the necessity for a stronger central government. No one was more industrious than Adams. He labored tirelessly – and skillfully – in Congress to move his colleagues toward the idea of independence and thereafter sacrificed considerably during years as a diplomat abroad. He understood America’s relationship with France better than Franklin, at least in terms on the dangers inherent in that relationship, and better than Franklin, Adams divined that a decisive victory had to be won in 1781 or France would quit the war. Jefferson was the most radical of the three, and alone among the three he saw the American Revolution as an opportunity for securing sweeping domestic reforms. Morris: Near the end of Setting the World Ablaze, you observe, “To the end, [Jefferson] was incapable of accepting the reality of his culpability in the perpetuation and expansion of African slavery and the danger it now posed to the achievements of the American Revolution.” To what extent is Jefferson denial unique? Please explain. Ferling: Before the early 1790s, Jefferson felt that slavery’s gradual end could be achieved. He was part of a movement in the Virginia assembly before the war to terminate the African slave trade, included a denunciation of slavery in his draft of the Declaration of Independence – which Congress deleted – and as a congressman in 1783-84 sought to prevent the expansion of slavery into trans-Appalachia. The great slave insurrection in San Domingo in the early 1790s – not to mention the burdensome debt in which Jefferson almost simultaneously discovered that he was trapped – changed his behavior. He no longer lifted a finger to destroy slavery. Knowing that it was wrong and that he was wrong to do nothing about it, he acted in a very human manner – he denied his culpability. Morris: In A Leap in the Dark (2004), you focus on a sequence of events during a period that extends from the Stamp Act of 1765 until Thomas Jefferson’s inauguration as president in 1801. In your opinion, which of these events best explain how the war was won…and lost? Ferling: A Leap in the Dark was a political history of the 1765-1800 period. I waited until I wrote Almost a Miracle to do a military history of the War of Independence. But the political leadership was crucial to victory. Above all else, unity among the colonies – the states after 1776 – was imperative, and unity required one compromise after another. For instance, in cobbling together a statement on the rights of the colonists at the First Continental Congress in 1774, the more radical congressman abandoned their insistence that the imperial authorities could not regulate colonial trade. Many congressmen were prepared to declare independence as soon as the war broke out, but most weren’t and John Adams – who led the pro-independence faction in the Continental Congress – wisely counseled patience. In the late 1770s, when Congress had to decide on the terms it wished to seek in the peace settlement, deep sectional fissures appeared, and compromises between northerners and southerners were essential if unity was to be maintained. Morris: Many people still do not as yet know that after the Declaration of Independence and winning a war, the thirteen colonies then had to win a peace during the years 1783-1787 if the new nation were to survive. Signing the Treaty of Paris signaled the successful conclusion of the first war. According to Joseph Ellis, there were four founders — Washington, Hamilton, Jay, and Madison — who helped to win what he characterizes as “the second American Revolution.” Do you share this view? Please explain. Ferling: I concur to a degree. Joe Ellis focuses on the “nationalists,” those who for the most part would be the conservatives during the partisan warfare of the 1790s. I think virtually all political activists in the 1780s understood that the central government under the Articles of Confederation lacked essential powers. By the mid-1780s, two years before the Constitutional Convention met, Jefferson came to see that Congress must have the authority to regulate commerce, while James Monroe, who voted against ratification in the Virginia ratification convention, believed that unless the central government was vested with greater power, the Union could not survive. The ultimate question, however, was how much power should the national government be given? Many of the nationalists had a second, more hidden agenda. The most conservative among them abhorred the social and political changes unleashed by the American Revolution and they sought – and achieved – a constitution that made further change extraordinarily difficult to bring about. I think the Union could have been saved by a constitution that enhanced the powers of the national government, but not to the degree taken by the Constitutional Convention. Morris: During the years 1765-1776, was there a “fail safe” point after which a war for independence was inevitable? In fact, did it occur earlier? Please explain. Ferling: The British ministry did not decide to use force until January 1775, ten years after the Stamp Act riots, a decision that only then made war unavoidable. However, in my view war was virtually inevitable from the moment of the first Anglo-American crisis in 1765, as the imperial authorities never displayed an inclination to back off the colonial policy they adopted following the Seven Years’ War. A succession of ministries pursued essentially the same policy and each had overwhelming support in Parliament. In the early years of the imperial troubles, one ministry after another thought it could achieve its ends short of war through tweaking its policies or from a belief that the colonists would comply if threatened. But no British government between 1765 and the outbreak of war ten years later entertained abandoning its policy of greater political and economic regulation of the colonies. From beginning to end, London sought to reduce the colonists’ autonomy, and when in January 1775 it came to believe that it could not achieve its ends peacefully, it ordered General Thomas Gage, the commander of the British army in North America, to use force. Morris: The Treaty of Paris was signed September 3, 1783, and ratified by the Continental Congress early in 1784. In your opinion, during the years 1783-1801, what was the single greatest threat to the new nation? Ferling: The greatest threat was internal and came mostly from powerful entities – merchants, financiers, and land speculators — whose ability to make fortunes was inhibited by a weak national government. Without remediation, some among those interests would have left the Union and formed their own government capable of helping them realize their goals, much as occurred in 1860-1861 when the planter dominated South realized it no longer controlled the national government, bolted the Union, and created its own confederacy. Morris: Please explain the reference to “hidden political genius” in the subtitle of The Ascent of George Washington (2009). Ferling: I meant that Washington, who was thought by the public to be above politics, was intensely political. He had acted with political acumen before the war in quest of his bounty lands and he was a “Federalist” a good ten years before the party came into being. Most couldn’t see it. Jefferson did not understand it until the middle of the 1790s, five years or more after he entered Washington’s cabinet. Morris: To what extent do your perspectives on Washington differ [begin italics] significantly [end italics] from those of many (most?) other historians? Ferling: I am more critical of Washington’s generalship in the War of Independence than are most historians. While I think he was the best man available for the position and he did much that was right, I concluded in my new book, Whirlwind, that the country was “lucky to have had him and fortunate to have survived him.” Some historians still look on Washington as largely above politics, a view that I do not share. Morris: Washington met with several disgruntled officers in Newburgh, New York, on March 15, 1783. What does his handling of that situation reveal about him, both as a leader and as a human being? Ferling: The Newburgh conspiracy remains shrouded in such mystery that even today it is impossible to know all who played a role in the affair, what some of the conspirators sought, and how much Washington knew (if anything) beforehand. His public handling of the affair brought him honor, which among other things appears to have been what Alexander Hamilton was seeking when he tipped Washington in advance to what was coming. Morris: For those who have not as yet read Jefferson and Hamilton (2013), what did they share in common? Ferling: They were similar in some respects. Both had unhappy childhoods, were intensely ambitious, extraordinarily intelligent, embraced republicanism, and became revolutionaries. Morris: What are the most significant differences between them? Ferling: Hamilton evinced little interest in social change and abhorred democracy, which he described as an evil. Jefferson saw the Revolution as the means of bringing about sweeping social and political change that otherwise could never occur so long as the Americans remained part of the British Empire. Jefferson longed to see the American Revolution spread beyond America. Hamilton, who had no interest in spreading the Revolution, feared and loathed the French Revolution. Morris: How specifically did their rivalry “forge” a nation? Ferling: Even after the Constitution was adopted, the shape of the new nation was far from clear. Hamilton’s economic programs sought to move it in one direction, Jefferson’s resistance to Hamiltonianism was a battle to take the nation in another direction. From the white-hot clashes provoked by their competing outlooks, a nation was forged that shared some of what each had sought. John cordially invites you to check out the resources at his website by clicking here.